Changes to the practical driving test came into force from 4th December 2017 - Read all about them here. 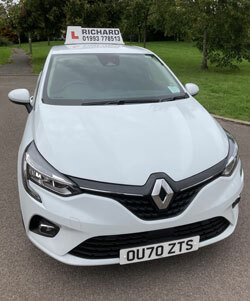 To book a practical driving test you should previously have taken and passed The Theory Test. You can book your Practical Driving Test by clicking here at the official government website. You can also watch the following video from the Driving Standards Agency giving more information on the test and how to book it. It's best to arrive at the test centre 5-10 minutes before your test. At the alloted time an exmainer will call your name. He will then check you licence details and ask you to sign a residency and insurance declaration. He will then ask you to lead the way to your car. Before you start to drive the examiner will ask you two car maintenance related questions in the form of a show me, tell me question. If you fail to answer these questions correctly you will be marked with 1 driving fault. Here is the current Show Me Tell Me question bank. During the drive candidate must drive within the law and within the conditions set by the environmental conditions. You will drive on a range of roads with different layouts and speed limits and you should be able to negotiate any major junction. You will not be asked to use Motorways. One in three tests will include a controlled stop, also known as an emergency stop. You will also have to perform one of the following: reversing manoeuvres. - Parallel park at the side of the road. - Parking in a bay. Either driving in and reversing out, or reversing in and driving out. - Pull up on the right-hand side of the road, reverse for two car lengths and rejoin traffic. The whole of the test is normally completed within 35-40 minutes. At the end of the test the Examiner will inform you whether you have been successful or not and then will offer you a debrief on your drive. It is useful to allow your Driving Instructor to listen in on the debrief. - Directions from a sat nav. The Examiner will tell you which one to follow. If successful the Examiner will give you a Pass Certificate and a copy of your Report Form. Then he will ask you if you would like him to send your Provisional Licence off so that it can be exchanged for Full Driving Licence, which will be sent to you later.